Jones Island is a peninsula formed at the mouth of the Milwaukee River, shaped as much by the city’s development as the lake and river that surround it. With easy access to fish, wild rice, and mainland resources, the marshy strip became an important Potawatomi summer village prior to white settlement. As the frontier community grew, schooners and steamships found the winding natural inlet difficult to navigate. The Army Corps of Engineers opened a new harbor channel through the northern part of the peninsula in 1857. This “straight cut” temporarily separated the peninsula from the mainland. The resulting island became known as Jones Island after James Monroe Jones, who had opened a shipyard there in 1854. Currents and waves gradually sealed the old river inlet with sand and restored the peninsula. Yet it remains known as Jones Island to this day. 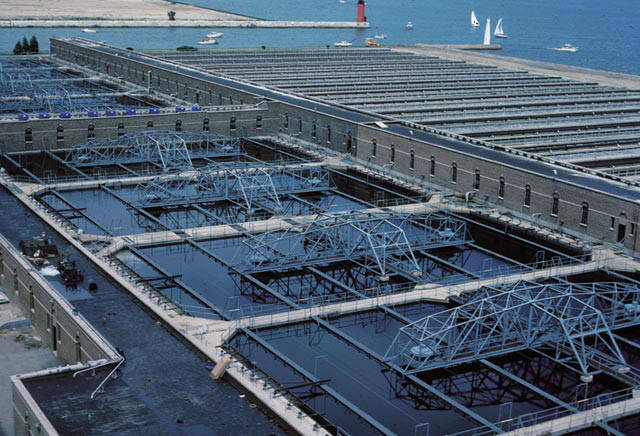 Jones Island was also an important site for Milwaukee’s urban health initiatives. In the mid-1800s, the city established a hospital, or “pest house,” in an old government building on the peninsula for residents afflicted with cholera and other infectious diseases. Decades later in 1902, the city addressed the issue of garbage disposal, always a health issue, by building incineration facilities on the peninsula. 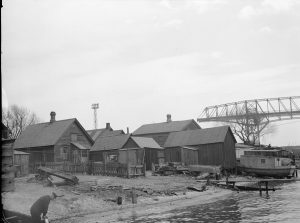 By end of the nineteenth century, the nearby Illinois Steel Company, hoping to expand their docking facilities, challenged the land rights of Jones Island “squatters.” The city quickened the peninsula’s depopulation, evicting its residents for the construction of a new wastewater treatment plant and updated harbor facilities in the 1910s and 1920s. In the 1970s, the Hoan Bridge spanned the length of Jones Island as part of freeway efforts to connect the city’s downtown and south side. The once-vibrant residential fishing community thus became a landmark of the modern metropolis, recognizable to passing commuters by its heaping piles of road salt, docked freight vessels, and the distinct odor of Milorganite. ^ Ruth Kriehn, The Fisherfolk of Jones Island (Milwaukee: Milwaukee County Historical Society, 1988), 1-2; John Gurda, The Making of Milwaukee (Milwaukee: Milwaukee County Historical Society, 1999), 6, 8. ^ Gurda, Making of Milwaukee, 77-78; Kriehn, The Fisherfolk of Jones Island, 5-6. ^ Gurda, Making of Milwaukee, 78. ^ Kriehn, The Fisherfolk of Jones Island, 3-4. ^ Gurda, Making of Milwaukee, 135; Kriehn, The Fisherfolk of Jones Island, 12-15, 20-21, 24-27. ^ Gurda, Making of Milwaukee, 135. ^ Kriehn, The Fisherfolk of Jones Island, 3. ^ Gurda, Making of Milwaukee, 203. ^ Jones Island’s last resident was removed in 1943. Kriehn, The Fisherfolk of Jones Island, 21, 36, 39, 46; Gurda, Making of Milwaukee, 262-263; John Gurda, Cream City Chronicles: Stories of Milwaukee’s Past (Madison: Wisconsin Historical Society Press, 2014), 84-85; “Let’s Go Fishing on Lake Michigan,” Milwaukee Journal, May 29, 1938, Roll 406, Milwaukee Features Clipping File, Milwaukee County Historical Society. ^ Gurda, Making of Milwaukee, 396-397. Gurda, John. “Change at the River Mouth: Ethnic Succession on Milwaukee’s Jones Island, 1700 to 1922.” MA thesis, University of Wisconsin-Milwaukee, 1972.